Mary Lou’s BBQ, at 226 Walton Avenue, just celebrated its one year anniversary. It’s hard to find much Texas in this corner of the Bluegrass, but Mary Lou’s BBQ in Lexington delivers an oversized taste worthy of the Lone Star state. It’s located in a funny little spot on the corner of Walton and Aurora Avenues, just off Winchester Road, down from the Jif peanut butter plant. It borders on a residential area, and is positioned nicely to become a true neighborhood hangout. Restaurants in general and barbecue in particular can be fickle endeavors in Lexington. It’s the land of the chain eatery. Much of the landscape is filled with pre-fab, faux-atmospheric choices that offer budget fare for the masses. While Owensboro and Paducah have established barbecue cultures, the same isn’t true of central Kentucky. It’s more a melting pot of all things. The barbecue tends to be extremely hit and miss in terms of authentic quality. 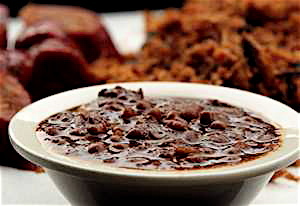 Too often thick sugary sauces are utilized to cover up poorly smoked meats. 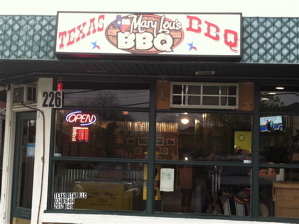 Thankfully Mary Lou’s, which opened in April 2012, is a welcomed addition to Kentucky’s burgeoning barbecue culture. The person behind this fine establishment is John Dance, who grew up on a farm near Williamsburg, Ky. He previously owned the Good Ol’ Days Barbecue restaurant in Midway back in the 1990s. Mary Lou’s, which is named after a dear family friend, is a natural combination of his Kentucky roots and love for Texas barbecue. “I have family in Arlington (Texas), and have been cooking down there for years,” Dance said. Being this is a Texas joint, I was particularly interested in trying the beef brisket. 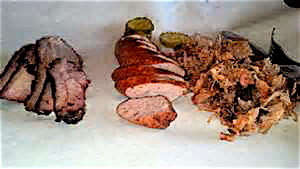 Kentucky and down through Tennessee is pulled pork country, along with mutton of Western Kentucky fame. It’s in the southwest where brisket and hot sausage are at the top of the menu. Just like attitudes in the Lone Star state, orders at Mary Lou’s come in two varieties, regular or Texas-sized. I cowboyed up and went large. 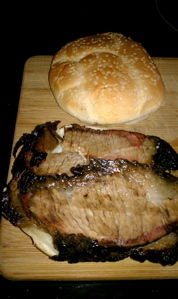 The brisket sandwich came out with four or five substantial quarter-inch slices of beef piled on an oversized poppy-seed bun. The smoky smell hits you first, like it’s been dry aged in smoke. Big chunks of charred beef ring the exterior of each piece, giving the slightest crunch to the more well done bits, before giving away to the buttery goodness of the interior. A visible smoke ring mixes with the right amount of fat to give each bite a smoothness. This strata of flavors just opens up and melts in your mouth. This is some seriously smoked critter. It takes the flavor right to the edge where there is even a touch of bitterness that works wonderfully. The smoke from the coals and the wood mixes with a vinegary essence that permeates the brisket. It tastes like Texas barbecue should, and is a hard sandwich to put down, no doubt. Campfire beans at Mary Lou’s. Mary Lou’s includes a side of sauce, for those who prefer wet barbecue. It’s dark red, thick, and nonoffensive. The brisket doesn’t necessarily need it, but a few dabs don’t hurt and it mixes well with the smokiness. Barbecue sauce should be negotiable. Too often folks spend more time concocting sauces than they do tending to the barbecuing. Whereas the brisket at Mary Lou’s comes out moist, and leaves this intense smoky flavor for diners to savor all by itself. Brisket, andouille sausage and pulled pork make a tasty 3-meat combo. I’ll be heading back to Mary Lou’s for their Texas Star Three Meat Combo, because if the pulled pork or andouille sausage, much less the ribs, are anywhere near as tasty as the brisket, I need to be eating here far more often. Also, rib tips are on the menu. Those can be damn yummy. I didn’t even try the sides, but did sample a complementary mash potato roll, which was delicious, as the owner brought out a fresh batch from the oven to share with those of us in the restaurant. I will mention the sandwich here was a tad expensive. The jumbo brisket at Brooks BBQ No. 2 is $6, City Barbecue’s is $7, and the one at Mary Lou’s was $9. This makes the platters or combos a better investment. Generally though it’s comparatively priced. Keep in mind Mary Lou’s is not a big place. There are a couple long tables inside, and oddly, three full-sized saddles that pony up to the bar for diners to sit on. Depending what time of day, it’s not a bad idea to call ahead for carryout. But if you are waiting, the television is on to watch games, and the beer is cold. Come by Mary Lou’s for some Texas-sized hospitality. This entry was posted in Food, Reviews and tagged Brooks BBQ No. 2, City Barbeque, John Dance, Lexington, Mary Lou's BBQ. Bookmark the permalink.